For 2018 GDPR Policy see foot of this page. Charity Street, Carlton Scroop, Grantham, Lincolnshire. It is worth pointing out that, if we are announcing various competitions that Members may decide to play in, this doesn't mean that the course is closed for general play or that it may be excessively busy. There are only a very few occasions when Sudbrook Moor's First Tee is reserved. Mainly: the second Saturday morning until m idday in every month for the Monthly Medal. Home League Matches on 4 Saturday afternoons per year between 12.45pm and 4pm. Senior Home League matches on 4 Thursday mornings per year. But for a very few isolated occasions, you can come and play anytime. Being this in mind we are not able to entertain visiting Golf Societies with Tee Reservations. However, we welcome up to 12 players in a group to play ( without tee reservations ). At Sudbrook Moor we believe in having the Course and its 1st/10th Tee Open for Play to Everyone as much as possible. There are only a few tee reservations during the year and we do not have visiting Societies. The main tee Reservation occurs on the 2nd Saturday of each month. This is when the club holds its Major Monthly Qualifying Medal Competition. The 1st/10th Tee is Reserved from 1st Light until all Competitors have cleared the 10th Hole. Course usually re-opens for General Play at 12:30pm approx. There is only one tee Reservation on a Sunday for the entire year and that is for the Gent's Club Championship. ( This will be the day following the Club's Monthly Medal on the second Saturday of the month in July ) The tee will be closed on the Sunday from approximately 6:40am to 10:40am. There are a few Tee Reservations on Saturday afternoons from April until September for our A-Team's home league match fixtures. These dates are listed on the Fixtures and Events Page and also the 'What's Happening at a Glance' listings. The Tee will usually be reserved from 12:30pm to 4pm on these occasions. The very few other Tee Reservations will be posted in advance, so please check the calendar and notices of these to avoid disappointment. This is the best 9 hole golf course I have ever played. It has matured well over the years and although it is relatively short with no par 5's, everything is relatively tight with greens to compliment and they have 18 pins. Some are on separate greens and some greens are shared, but it is nice to have the differences. Accuracy does you far more good than being able to hit a long way and there is good shape to many of the holes. This course also has to be the best value 9 hole I have ever played. The quality the course is kept in is always very good and your green fee allows you to play as many times as you like all day. This is just ?12 in the week and ?14 on a weekend and cheaper still in winter. I would highly recommend the course. Sudbrook Moor is a 9 hole golf course situated in a beautiful part of West Lincolnshire Standing on free draining land the course is well established with mature trees, strategicaly placed water hazards and bunkers. Playing to different pin positions for the back nine provides an 18 hole experience. It is 29 years since Tim Hutton left his position as club professional at Sleaford Golf Club to create a new venture with his family at Carlton Scroop. With 20 years in the golf industry to that date, Tim had identified a need for a place that encouraged people to try golf. At the time golf was often perceived to be exclusive, expensive and not always friendly towards anyone wanting to take up the game, particularly children. Furthermore, the only venues that were readily available to budding golfers were limited to seaside pitch and putts and crazy golf. Tim owed his career in golf to Boston Golf Club with the encouragement of the members and the mentoring of Club Professional, Terry Squires. Up to 29 years ago Tim had not seen anything that compared with Boston for the inclusiveness that he experienced there in the 1960s. As a result of this, he founded Sudbrook Moor Golf Club on the principal of Affordable, Quality Golf for All, in a Friendly Environment. 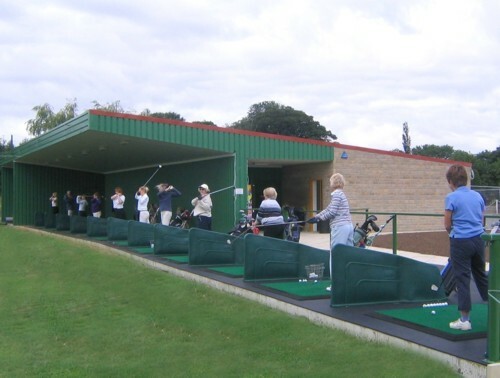 Since then thousands of local people have experienced the thrill of golf for the first time at Carlton Scroop. A large proportion of the members of local courses, many of these developed in the 1990s, hit their first golf ball at Sudbrook Moor. However, with good all year round ground conditions, the golf course is now well established and is attracting and retaining many golfers in its own right. The Junior golfing programme has produced several outstanding players, non more so than 2008 Lincolnshire Amateur Champion, Danny Keddie, who is now on a golf scholarship in Tennessee. Danny started at the age of 6 and owes much of his competitive prowess to Sudbrook Moor members, who allowed him to join them in club competitions, just as Tim had experienced in his early days at Boston Golf Club. Assisted by his wife Judith and sons Simon and Ben, without any subsidy or grant, the family have ploughed everything back into maturing the golf course and the facility that it is today. Judith, a physical education teacher, is Club Secretary and Junior Organiser. A PGA Qualified Professional with 17 years of tournament and coaching experience, Ben has recently taken over from his father as Head Coach. Fineturf, developed by elder son Simon into one of the countries leading turf production, installation and maintenance companies, manages the golf course with talented Head Greenkeeper. James Sergeant. Together they have upgraded the 9 hole golf course with many innovations, improvements and refinements, creating an 18 hole experience by enhancing the second round, which is played to different greens and flags. Spending the first 6 years of his career as personal assistant to Dai Rees CBE, 5 times Ryder Cup Captain and golf star of the post war years, Tim Hutton has received national recognition with the Sir Henry Cotton Award for outstanding services to junior golf and is an Honorary Member of the Golf Foundation. As a Midland PGA Professional of the Year, a title since held by Lee Westwood, Tim is now a Fellow of the Professional Golfers Association. Drawing on this experience in the current financial climate, the Hutton family are committed, more than ever, to provide the area with affordable, quality golf for all, in a friendly environment. The Golf Repair Workshop is available during Golf Shop hours for Club Repairs and Re-Gripping. The Golf Academy - Please see PGA Professionals for coaching times. SMGC has a relaxed dress code. However, players are requested to dress smartly in clothes normally associated with golf. Shorts must be tailored and men's shirts must have sleeves. Note reference shorts: Beachwear type are not allowed. Note reference shoes: Trainers or any flat shoes are allowed. Golf shoes with metal or softspikes. Sudbrook Moor Members are reminded to check our Competition Conditions for the Dress Code for playing in all Sudbrook Moor Competitions. Denims are not allowed when playing Official Sudbrook Moor Competitions. ( Medals, Stablefords, Summer/Winter Knockout Matches etc) Failure to comply with these extra Conditions will result in Disqualification from the Competition. All of the facilities and playing areas at Sudbrook Moor have been professionally designed and laid out with safety of use in mind. This statement has been prepared by Tim Hutton, who currently has 57 years of experience in golf. With 50 years as a professional golfer, his experience has been as a European Tour player, a golf club professional, a golf course designer and constructor, a golf coach, a retailer and a golf club director. Sudbrook Moor was designed to accommodate beginners and established golfers. The golf course was designed and routed in such a way as to minimize the danger from errant golf shots. In addition to these considerations on the golf course, the teeing areas have been organized in such a way as to control where golfers accumulate, reducing the danger of serious injury from fast moving golf balls, including rebounds. In the 32 years of Sudbrook Moor, to date, there have been very few incidents of injury on the playing areas. These have been minor injuries incurred by golfers not standing in the appropriate places, when waiting for other golfers to play their shots. A golf course, at best, is still a place where freak occurrences can cause serious injury. As well as endeavoring to reduce these possibilities to the minimum, it is incumbent upon golfers to be aware of the dangers and to be vigilant in their pursuits. Young golfers at the Junior Clinic are made aware of some of the dangers of golf, with a strict code of movement around the Driving Range. They are further mentored on the golf course by established players during the Junior Intermediate competitions. Parents must stay with their children for the duration of the Junior Clinic. For a child not to be in the presence of a parent on Sudbrook Moor Golf Club premises: this must only occur with the full approval of the parent and a specific time arranged for child and parent to be reunited. Sudbrook Moor is a "self service golf course" and it is assumed that golfers are aware of the implications and dangers of playing golf. If there is bad visibility, golfers play at their own discretion. If there is a risk of lightning, golfers are advised not to play. Juniors must have the full approval of their parents or guardians before they play on the Golf Course, the Driving Range or the Practice Facilities. 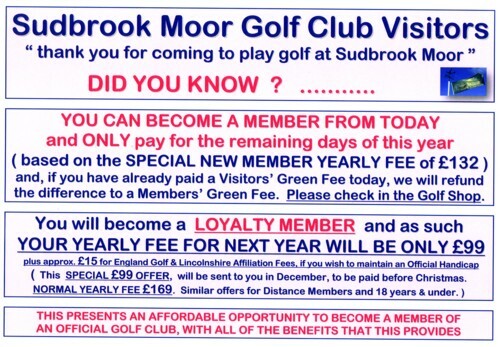 Sudbrook Moor Golf Club collects your name, address and telephone numbers. It is your option to give us your email address on a separate slip that accompanies the Membership and Membership Renewal Forms. We collect your name, address and telephone numbers on your Membership Forms to be able to contact you about your Membership Renewal, to provide you with general information or to contact you or your family in the case of an emergency. This information about you is not held electronically but on paper files. If you provide us with your email address we may send you a newsletter, general information, a video clip or information about any offers that may be available from the Golf Shop. This form of contact is not targeted to individuals but sent to all of the email addresses we currently have. Your email address is not shared with any other body. If at any time you no longer wish to be contacted by email please contact us and we will permanently remove your email address from our list. If at any time you think the information we hold about you is incorrect, please contact us. However, we send you a Membership Renewal Form every year for you to complete and if you renew your membership, that form becomes the new paper file with your latest details. Cookies are text files placed on your computer to collect standard internet log information and visitor behaviour information. This information is used to track visitor use of the website and to compile statistical reports on website activity. A cookie in no way gives us access to your computer or any information about you. For further information visit www.aboutcookies.org or www.allaboutcookies.org. You can set your browser not to accept cookies and the above websites tell you how to remove cookies from your browser. However in a few cases some of our website features may not function as a result.